I began this post a few weeks ago and it has been hectic here with a little touch up painting and staining doors mixed in with football weekends and a little travel. Now I am ready to enjoy getting ready for the holidays. Thank you to all who have sent me notes to say I was missed! Hello sweet friends. First I want to say Panama City, Florida is in my thoughts and prayers. Such a terrible hurricane leaving so much property damage and now hardships for those living there. A beautiful town with sugar white beaches. We know it well, a favorite vacation destination and my daughter-in-law's family and friends living there. Update: All power has been restored to Panama City. Clean-up and rebuilding will take a long time after so much devastation. Jim and I have been traveling with our son, daughter-in-law and grandson. When we left home our highs were in the mid nighties. Returning home the weather channel promised the first cool front for the weekend. 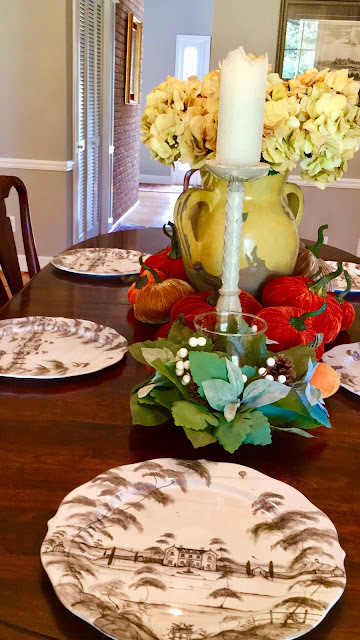 Now we have our first weekend here with fall temperatures and I finally feel like adding a few fall touches around the house. 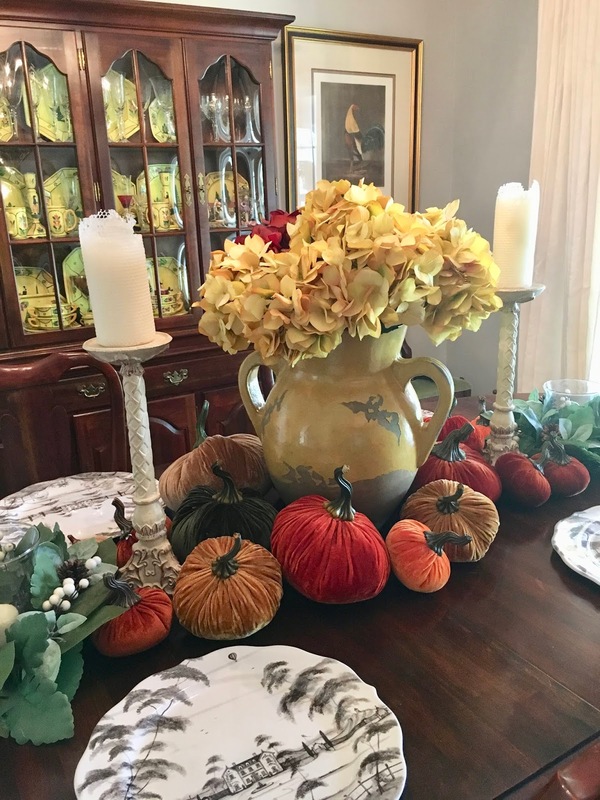 I like to keep it simple so I added my velvet pumpkins on the dining room table with my Juliska Flint charges. We always enjoy cooking out but fall is a favorite time. We love to watch SEC football outside while we enjoy the cooler temperatures. We have been grilling fish a lot lately, my favorite. It is such an easy meal to prepare. Spray the fish with EVOO and use your favorite seasoning. We like to blacken our fish so I use Paul Prudhomme's Magic. I have a lot of catching-up the next couple of weeks. I will be adding more fall touches inside and out. I'm overdue for a visit to the pumpkin patch! I'm sorry I've missed some of your posts so I will be visiting with you soon. As always, thank you for your visit. I love for you to leave a comment, it's the only way I know you stopped by! 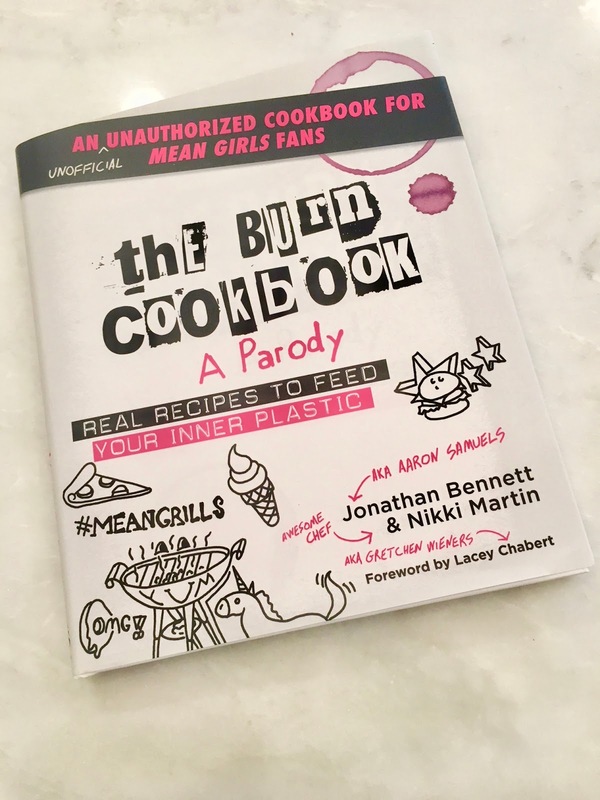 I want to give a shout-out to my friend Deb at Mountain Breathes for a chance to win this funny cookbook, The Burn Cookbook by Jonathan Bennett and Nikki Martin. My name was the lucky one drawn. Thank you Deb! I will enjoy the recipes and the laughs. 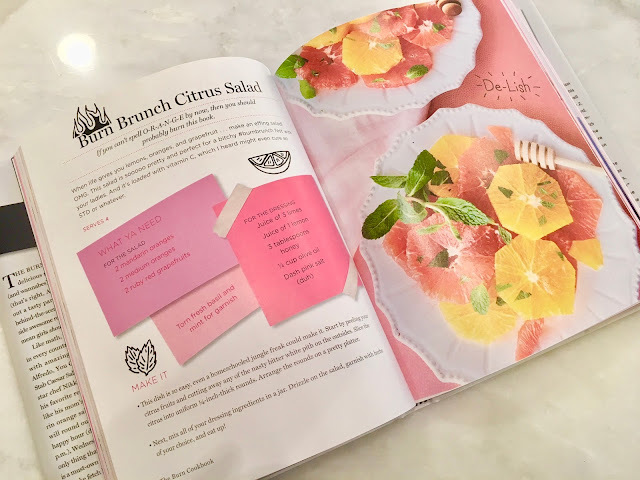 Visit Deb here to read all about this entertaining cookbook. 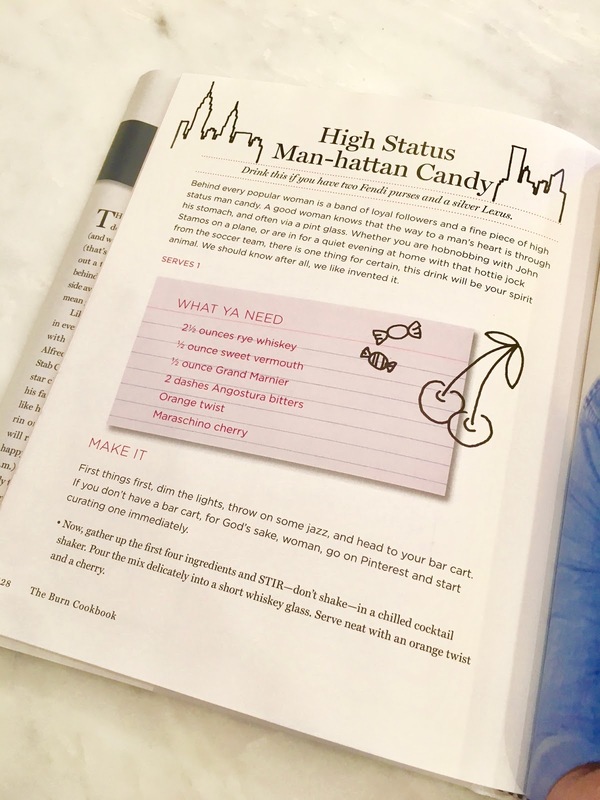 I've already found several recipes I can't wait to try. Welcome back, Emily! It has been a long time. And even though it's certainly in the midst of fall, so many people are decorating for Christmas. I like that you're taking your time with fall. Enjoy it! How fun to be out gallivanting around with family! Hope you had a wonderful time. I know you'll have lots of fun getting everything ready for Thaksgiving. The fish looks absolutely delicious. Good idea for this weekend. Oh, that fish looks delish and your table just beautiful. I love the texture with the velvety pumpkins. Sounds like you were gone a long time. It's weird, isn't it -- leaving home with one batch of weather and returning to something completely different! Welcome back. 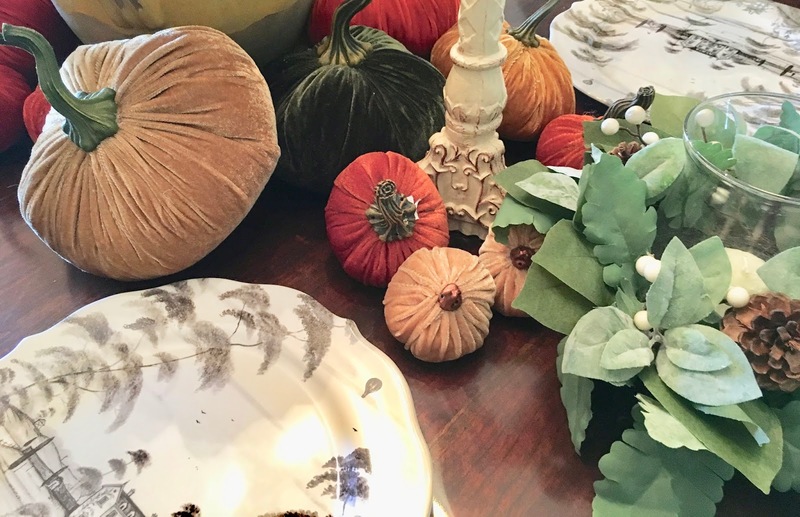 Love your velvet pumpkins and dishes on your table. Sad for all that have to deal with the wrath of mother nature. I can't even imagine. Great to see a post from you, Emily! I know it has been a busy fall for you with much pleasure being with Connor. 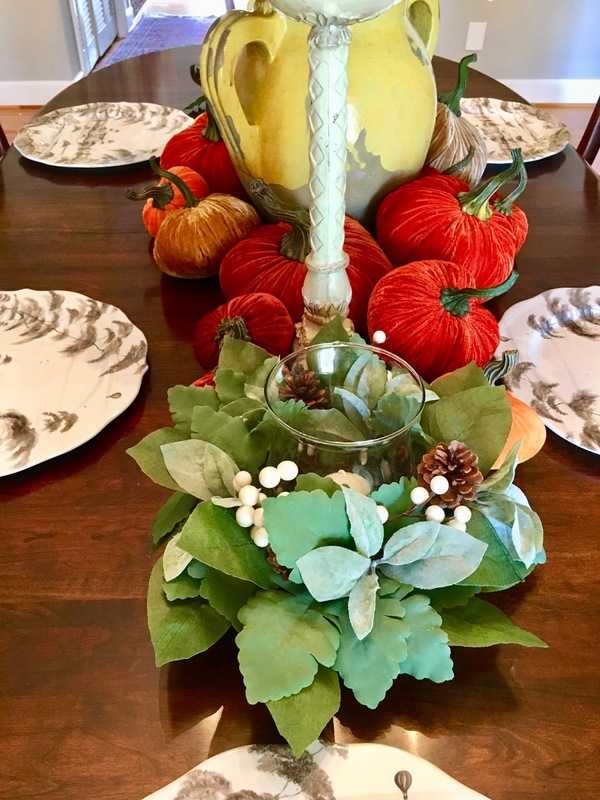 Your table is perfect for fall. Velvet pumpkins rule here too, at least inside the house. I have a few serving pieces of the Country Estate in the Flint. Just love this pattern and have been enjoying my Autumn Traditions all fall. I'll be sad to pack them away after Thanksgiving, but will bring out the Winter Frolic. I know you have beautiful pieces in this pattern too. 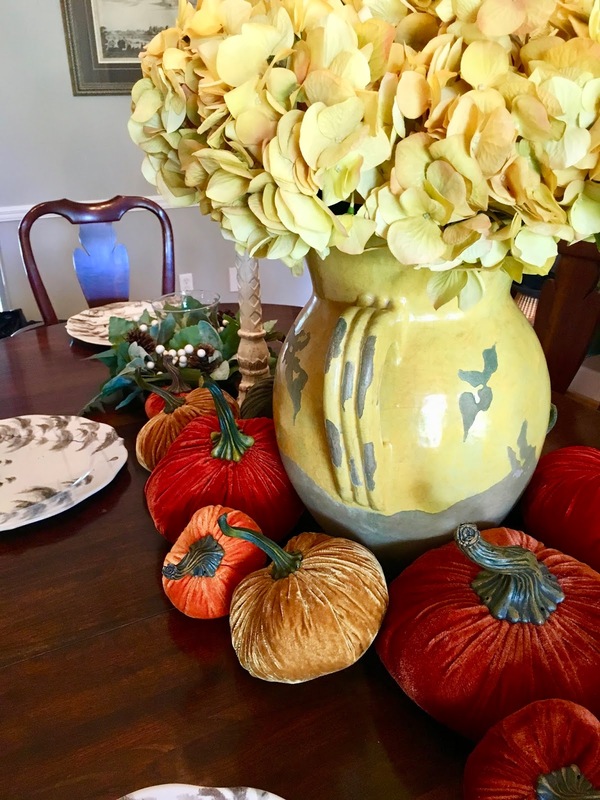 Your velvet pumpkins look so beautiful on your table Emily! and those Juliska chargers are gorgeous! I know you've had a busy busy fall, but what's more important than family fun! I always love peeking into your home and seeing your beautiful things! One of my favorite things about fall is football, and it sounds like yours too, nothing better than grilling out and watching the game! Your fish looks delicious, so healthy too! Looking forward to catching up soon! Oh, those velvet pumpkins!!! So pretty. Enjoy the holidays! Your fall touches look beautiful, Emily. I love your velvet pumpkins and I need your orange one! Always enjoy seeing your Juliska dishes and your china cabinet full of your beautiful Quimper. 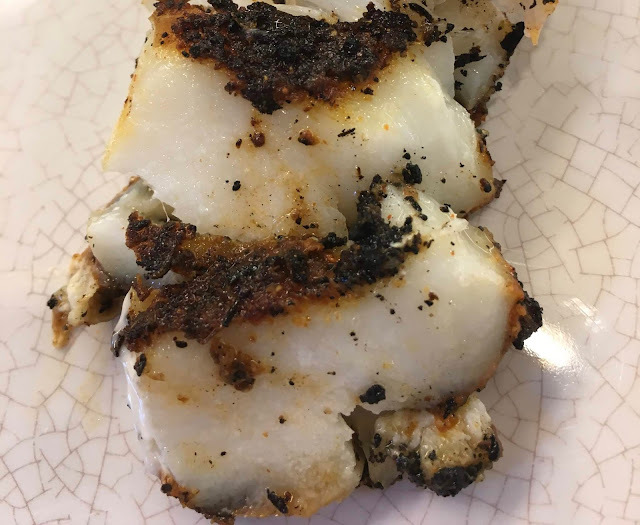 Your blackened fish look delicious. I'm showing your pic to my husband. He used to blacken and I don't know why he quit. I'm sure your town will be hopping the next two football weekends. Cheering for Alabama. 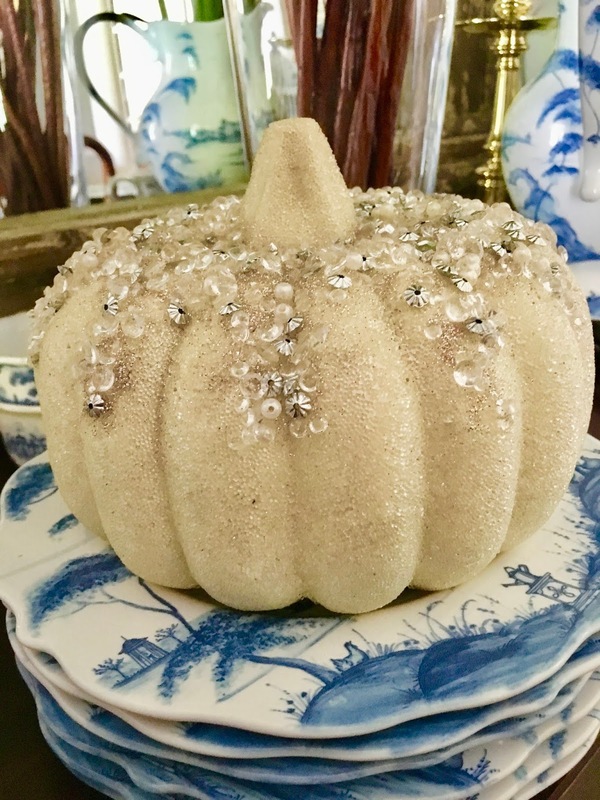 I have that same jeweled pumpkin on my kitchen table! I just love it. I love all the velvets too, I have a few but not as many as you do - wow! That last photo of your fish is wow! Interesting how you did it on the paper. That looks fascinating and so yummy. I’ve been thinking about you Emily, particularly when I heard about Florida as I know you enjoy visiting often. I wonder how that beautiful town, I think it’s called Seaside, weathered the storm? Your velvet pumpkins are beautiful, as are your chargers. Your velvet table laden dining table looks so pretty, Emily. 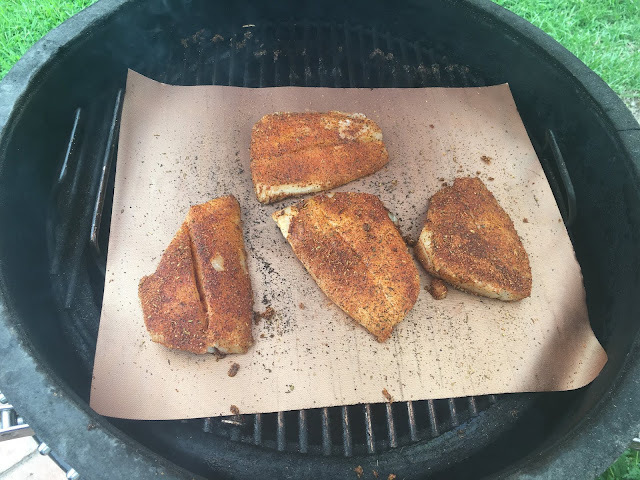 I love blackened fish, too, Emily, and cooking it on the grill with parchment paper is a great idea! Congratulations on winning Debbie's giveaway. I'm glad that you had a good time traveling with your family and that all is well. I enjoyed catching up on all your news, Emily. And love your decorations, especially the velvet pumpkins. Best time of the year! 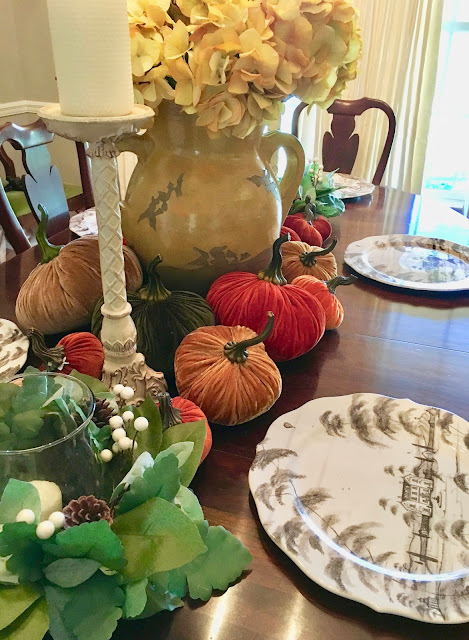 A beautiful fall table. I hope you had a wonderful Thanksgiving celebration. Question, I curious about the paper on your grill and how it works with the fish.